Huge Savings Item! Free Shipping Included! Save 14% on the Gold Privacy Screen Filter for 24'' Widescreen Computer Monitors - Anti-Glare by GeckoCare by GeckoCare at Andy Pemberton. Hurry! Limited time offer. Offer valid only while supplies last. 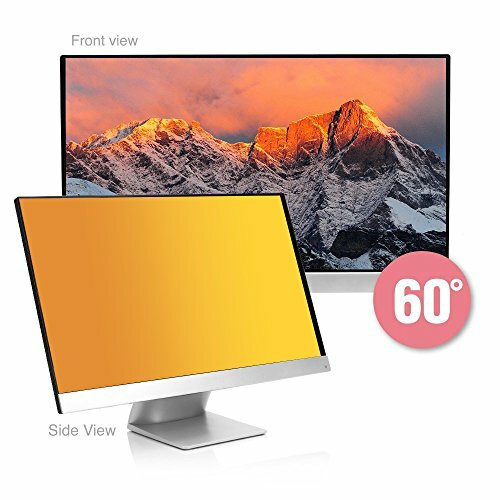 Gold Privacy Screen filter for 24'' Widescreen Computer Monitors 1. Privacy Screen is designed to fit 24'' widescreen monitor with 16:9 ratio screens. 【EASY TO INSTALL OF 24 INCH PRIVACY FILTER】 24 inch privacy screen protector filter comes with 2 different attachment options that offer you 2 easy ways of installing the 24 inch privacy screen for widescreen monitor;Option 1 consists of Optically clear adhesive attachment strips & Option 2 consists of Slide mount tabs - both of these are extremely easy to use, enabling anyone to install/uninstall effortlessly. 【 EYE PROTECTION 24'' PRIVCY SCREEN FILTER】24 inch privacy screen for monitor not only provides privacy but also protects your eyes by filtering out 95% UV and curbing blue light by 60%, which can otherwise have an adverse impact on your eyes. The screen filter is reversible, giving you the flexibility to choose matte or glossy - Place the matte side facing you for reducing extra glare. 24 inch privacy screen for monitor also helps keep your screen safe from dust and scratches. 【FULL WARRANTY 24 INCH PRIVACY SCREEN FOR MONITOR】Our promise to you! If you are not satisfied with this 24 inch privacy screen for monitor, we will provide a FULL refund or replacement without any questions asked! This makes your purchase absolutely risk-free and you can enjoy testing out its quality and durability!